LEBANON – There were definite underdog/favorite overtones. It had drama, intrigue, big plays, atmosphere, rivalry, suspense, defense and strategy. It had everything – and more. Forget all that ‘instant classic’ horse hockey, this contest will live on in the memories of those who were there for years. But most importantly, it was good for Lebanon County scholastic sports. 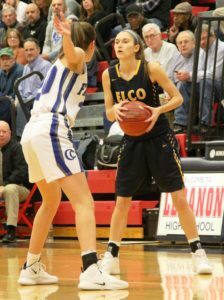 On Wednesday evening at Lebanon High School, in a semifinal contest of the Lancaster-Lebanon League playoffs, Elco edged Cedar Crest 36-34 in overtime of one whale of a local girls’ scholastic basketball game. 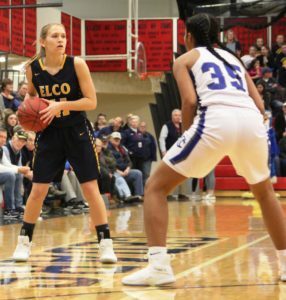 After the teams traded last-second buckets in the fourth quarter, and regulation ended in a 32-all draw, Raider senior star Ryelle Shuey tallied what would prove to be the decisive basket, with 1:38 remaining in the initial, four-minute overtime session. 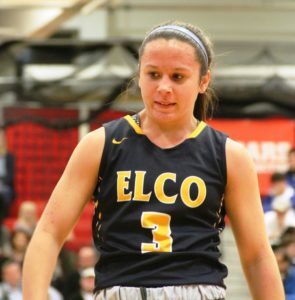 Fellow Elco 12th-grader Julia Nelson had opened the OT period with an inside basket. But Molly Bucher responded for Cedar Crest 23 seconds later with a pair of free throws. 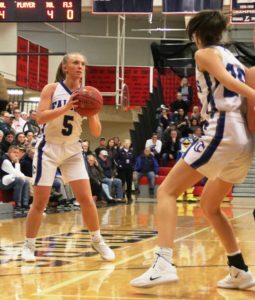 It was Bucher who had given Cedar Crest a 32-30 edge, with seven seconds left in the fourth quarter, with a hard-nosed driving lay-in. 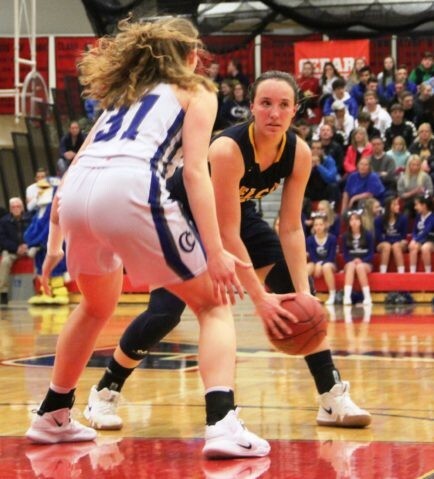 But the Raiders went the length of the court in the remaining time, as sophomore guard Katelyn Rueppel got the ball to Shuey down low, and she beat the buzzer with a tough inside move that forced overtime. 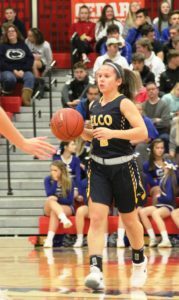 It was a monumental triumph for an Elco squad that seems to be getting better as the season wears on. Now 20-4 on the year, the Raiders, the runners-up from Section Four, advanced to what is beleived to be just their second Lancaster-Lebanon League championship game in program history. That contest, versus defending L-L League champ and undefeated Lancaster Catholic, will be staged at 7 p.m. on Friday at Manheim Township. 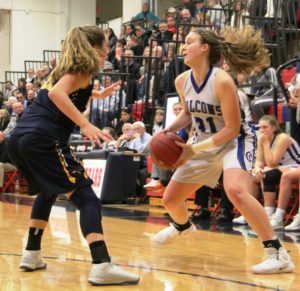 Cedar Crest, the Section One champions, who slipped to 17-6 overall, will see its next action in the District Three Class AAAAAA postseaon on Monday at home against Central York. 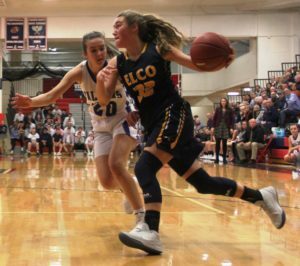 “This is at the top,” said Elco head coach Ashli Shay, when asked to put the victory in a historical perspective for girls’ basketball at Elco. “The difference between the experience as a coach and a player is that it’s more rewarding as a coach. To be on this end of it and see how excited they (her players) are makes it even more special. From the outset, it was apparent that this one would come down to the wire. 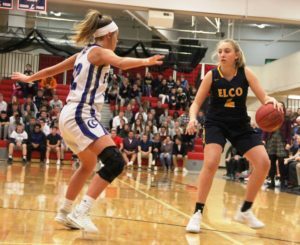 Elco began the final quarter with a 7-1 run, one which consisted of two Amanda Smtih free throws, a Shuey bucket and a Rueppel three-pointer – to take a 29-28 lead. 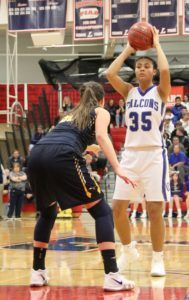 Senior Raven Morgan regained the lead for the Falcons 17 seconds later, but Raider Kailey Eckhart’s charity toss, with 1:47 left in regulation, knotted the score at 30. It also set the stage for the frantic ending that ensued. “It was crazy, in all the good ways,” said Shay. “It was an exciting game. We dug a hole for oursleves twice. It’s unbelievable that we didn’t pack it in. 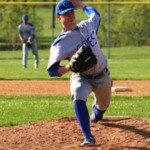 Cedar Crest is a fantastic team. 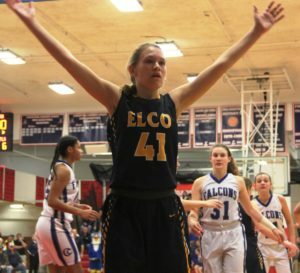 The Falcons threatened to blow Elco out of the gymnasium in the third quarter. 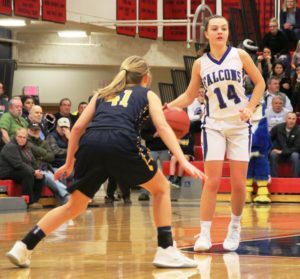 Thanks to a couple of inside baskets by Morgan and three-pointers from Reese Glover and Bucher, Cedar Crest opened the second half on a 10-2 run to expand its lead to 25-15. 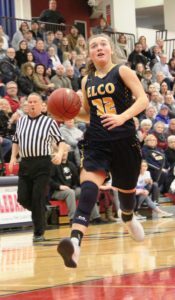 Elco’s answer featured jumpers from Smith and Rueppel, and an old-fashioned three-point play by Shuey that drew it to within 25-22 of the lead. 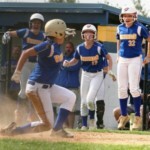 Shuey played one of her best games of the year and one of the finest of her illustrious career. 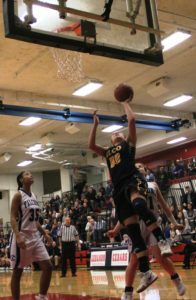 Battling Morgan and Hannah Woelfing on the blocks, Shuey struck for a game-high 17 points and hauled down ten caroms. Morgan pumped in a dozen Cedar Crest points, a total matched by Bucher. Cedar Crest outscored Elco 15-3 from behind the arc, but the Raiders outscored the Falcons 26-16 on two-pointers. 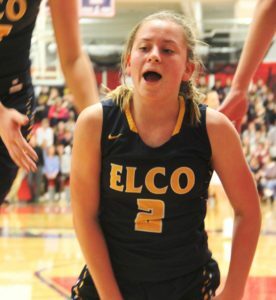 Elco converted seven of its ten foul shots. “She’s just a winner,” said Shay of Shuey. “She’s made so many plays. Was it her best game? Yeah, it might’ve been. 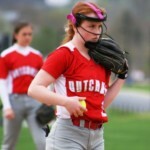 She took command of the game. She proved she belongs in this atmosphere. Early on, the Falcons enjoyed the better of the defensive struggle, thanks in part to the three-ball. 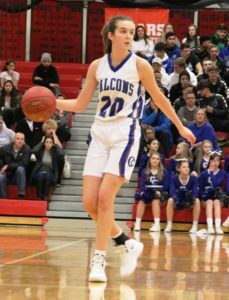 Cedar Crest held Elco score-less over the contest’s first 4:08, and led 5-0 on a Bucher trey and 10-4 on a Madison Rambler triple. 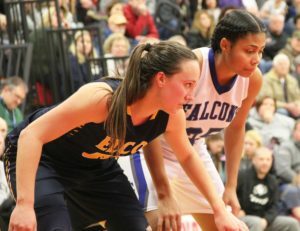 The Falcons’ advantage reached 13-5, on another Rambler three-pointer, 1:30 into the second quarter. 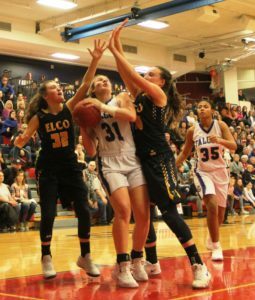 But Elco held Cedar Crest without a point over the next 6:28, while receiving four points apiece from Shuey and Smith to tie the score at 13.